The trailblazer is a perfect car for outdoor enthusiast. I have owned my car for roughly four years now and it has been running almost perfectly since. It drives very well in the winter. It handles perfectly when the road is slick and the 4WD never lets me down. Commuting to and from college is not an issue until I fill up the gasoline tank. From empty it will cost me around $65 for a full tank and seems to be empty in three days. The computer says that I get 15. 2 miles to the gallon but I think that is a bit high. Now that she has some mileage under her belt some parts tend to go faster than normal; ball bearings and oil. But other than the repetitive filling of the tank I love my trailblazer. It is the best for when it comes to road trips because I can pack it full of gear and still fit three other passengers comfortably! In the future if Chevrolet makes a newer trailblazer with better gas mileage I would consider buying it. Coming from my personal opinion, if you are an outdoor enthusiast or have a hobby that requires room for transportation I would totally recommend the trailblazer. However, if you are commuting and do not like to go on weekend outings I would not consider this car. Some pro's and con's of the best midsize SUV I have ever driven. It has been a great all-around vehicle, done everything from loading up for college to going camping in some remote areas, unerring throughout cities and cross country trips. I have received many compliments about how smooth of a ride it is, how comfortable it is to sit and/or sleep in, and how much it has been able to carry. Be it people or items it has enough room for it all and then some. It also has a nice towing capacity. It is not great at acceleration, which is as to be expected since it is an SUV, but it is highly durable in a crash as it received very minor damage while totaling the other vehicle. After a few years though it does develop an electrical issue I haven't seen in other vehicles. Such issues include the radio/speaker system going out, the wiper controls mixing with each other such that trying to use one setting uses a different one, the wipers activating upon startup of the vehicle and persisting for anywhere between 2 minutes and indefinitely. Overall I'd give it a 9/10. Overall, great and reliable vehicle if properly maintained. 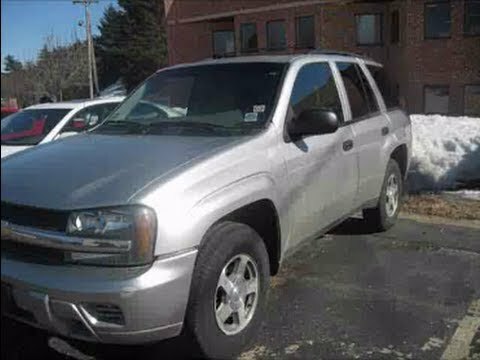 All in all, I would give the 2006 Chevy Trailblazer a 4-star review. I absolutely love the fact that it is reliable, very safe in extreme winter weather, and is generally low maintenance (If it is properly and consistently maintained). That leads me to another point - keep up on the maintenance!! If you do not, you will find yourself in one headache after another with this particular vehicle. Proper and timely maintenance will keep this vehicle running for a long time. My fiancé and I have almost reached 250 thousand miles on ours! The one part thing that can be a tad bit annoying is that the water pumps tend to go very quickly on these, and they're not very cheap to fix. Other than that, we are happy with our Trailblazer.